GDG Cebu is thankful with the overwhelming support that it has received from its supporters, sponsors and members. 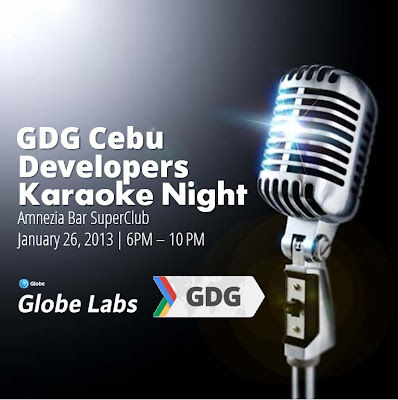 As an opening salvo for the new year 2013, Cebuano GDGers will open the year with a Karaoke Night that will unveil future plans and events of the community. Please RSVP by signing up here: http://goo.gl/nwqUY. Follow us by joing the the GDG Cebu Community or Follow us at Twitter @gdgcebu for twitter updates. You can also email them at gdgcebu[at]gmail.com .